Ok, time to write about our Singapore trip before I forget all the details. My memory's been really bad these days. I always forget where I put my mobile phone and I can't call it because mostly it is on silent mode. Very exasperating! lol. Sorry, I digress. 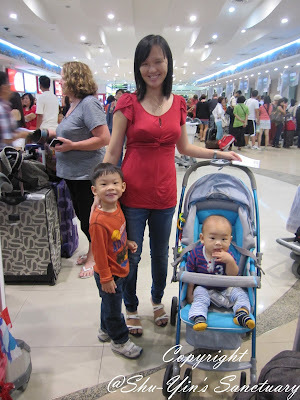 This Singapore trip was the first overseas trip we took as a family of four. Just hubby and I taking care of a 4yo and 11mo baby and I thought it would be a gruesome trip, but it turned out to be a great trip. Packing for the trip took me a week in advance! As I knew, packing kids and baby stuff is so troublesome with so many things to pack - diapers, milk, thermometer, medicine, swimsuits, hats, sunnies, toys and activity kits, etc and even baby scissors! 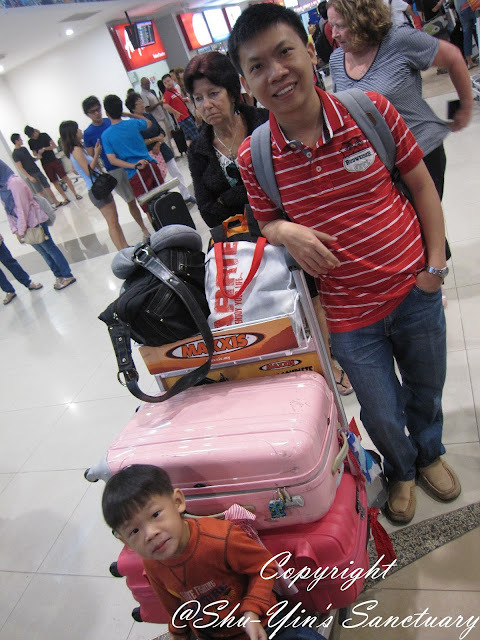 I packed 2 medium-sized checked in baggage (see the 2 pink luggage below, well, that's ours!. Hubby carried a backpack and me sling over my Emily Storksak diaper bag. 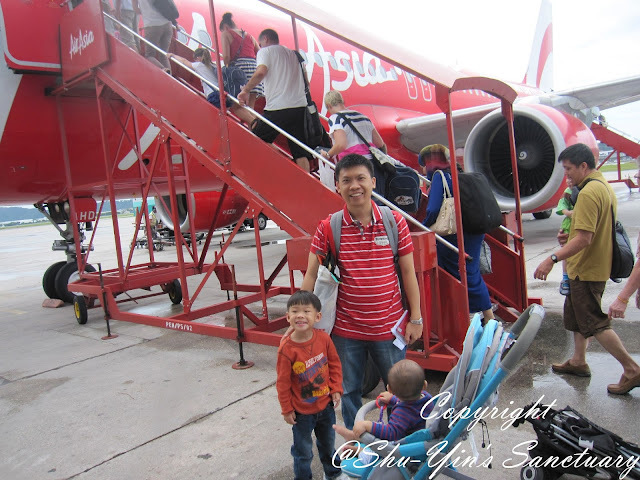 We took Air Asia because it was the cheapest (less than RM1k for ALL of us round-trip, including baggage charges and 2 nasi lemak!). Getting ready to drop off our luggage and to check-in. The only mistake I did was to book the flight on Singapore National Day itself *smack own head*, so I prepared myself for jam-packed Singapore on that day. 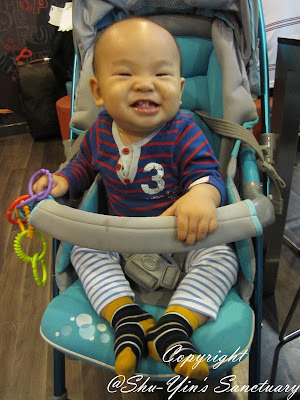 Look at Khye's happy face in the stroller while the 3 of us munched on McD at the airport for brunch. 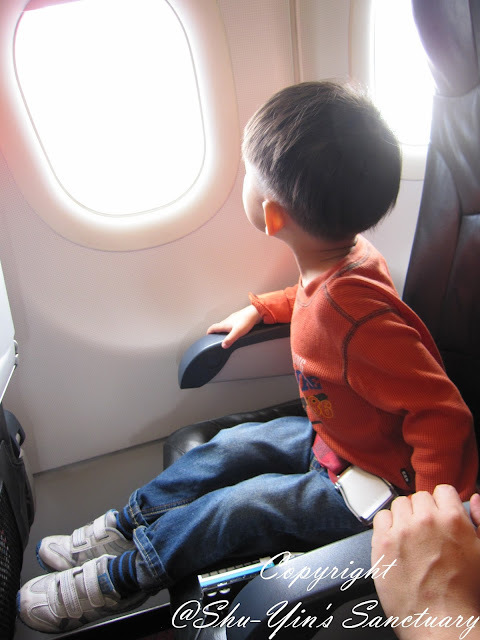 Shern was excited watching the planes and flying as it was quite some time since he last flew. (the last time was South Africa trip in Dec 2011). 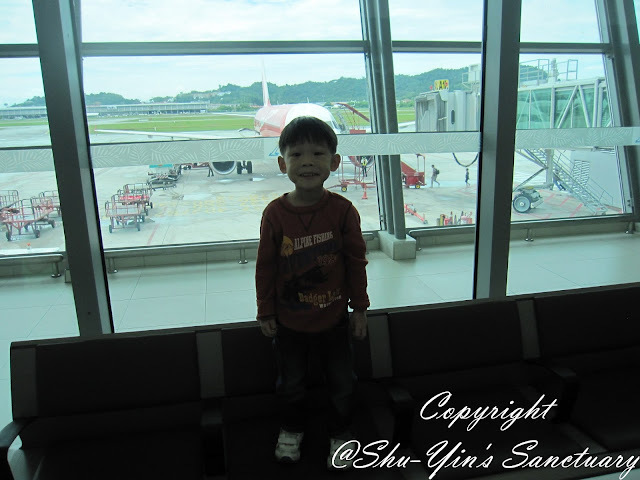 With Air Asia, we always need to walk to our planes. 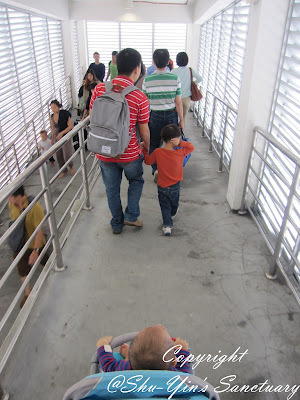 I was happy to note that after the airport reno, there were ramps so more stroller-friendly, and not walk down the stairs. 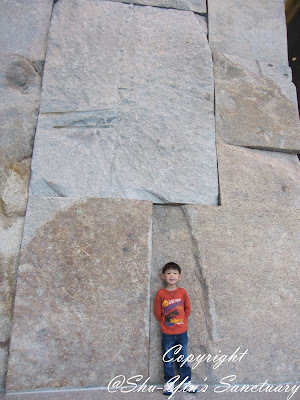 Took a photo before we parked our stroller there for them to stow. 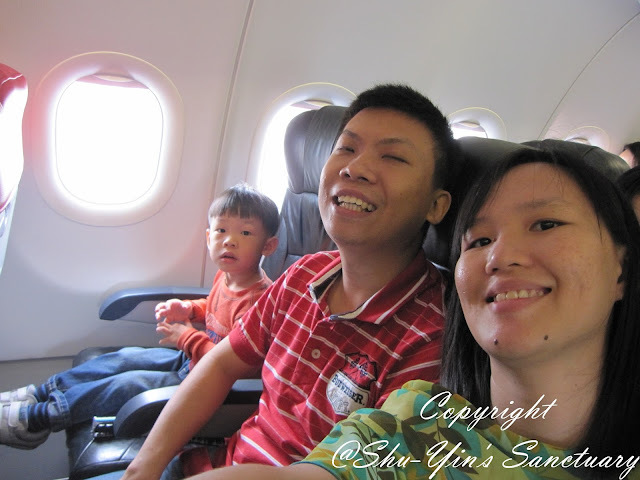 In the plane, Shern sat at the window seat as he loves to look out the window. Hubby sat in the middle so that can entertain Shern and also help me out when needed, while Khye and me sat on the isle seat. 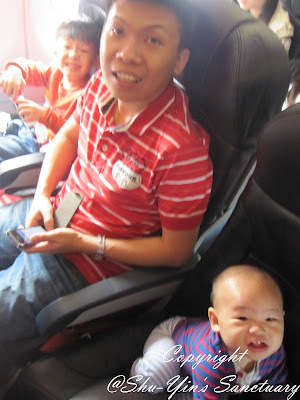 Air Asia steward/stewardess did not provide me the Infant Seat Belt until I asked for it. 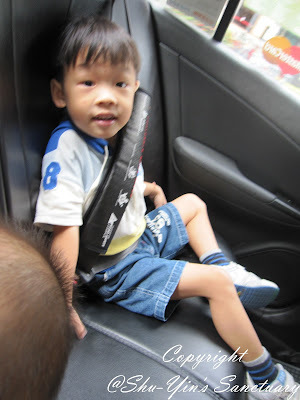 I always want to buckle up Khye too for just in case scenarios. (I think I watch too much 30 Seconds To Disaster!). Fyi, the Infant Seat Belt is buckled up through my seat belt. 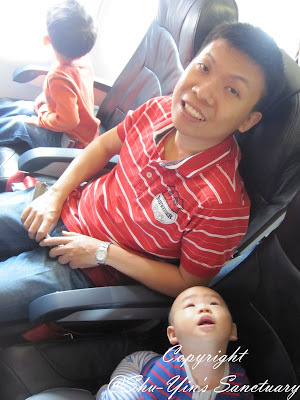 It was a smooth journey for me as Khye fell asleep the moment we got on the plane. 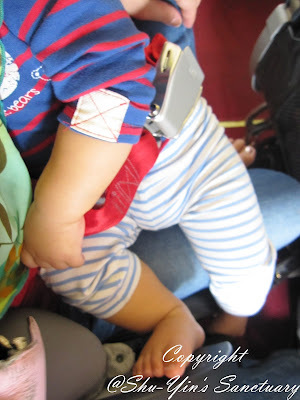 I also nursed him when the plane took off (to prevent ear pain) as it was Khye's first time flying. Shern just sat at his place with the seat belt on and looked out the window when the plane took off. He had fun as he was busy with the train and activity kit I packed for him. 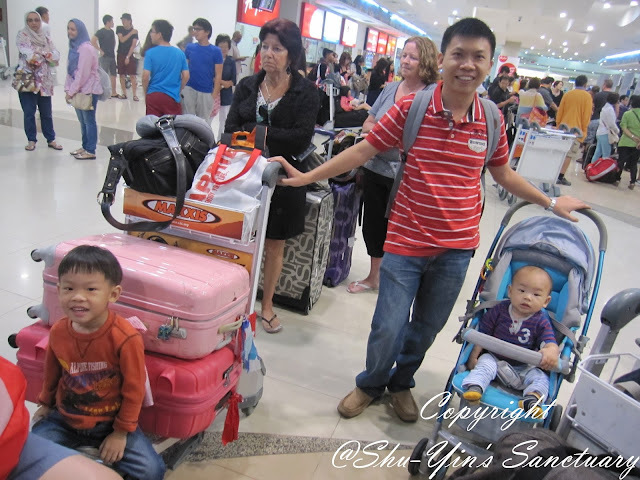 After we landed, we collected our luggage and went straight to the taxi stand. 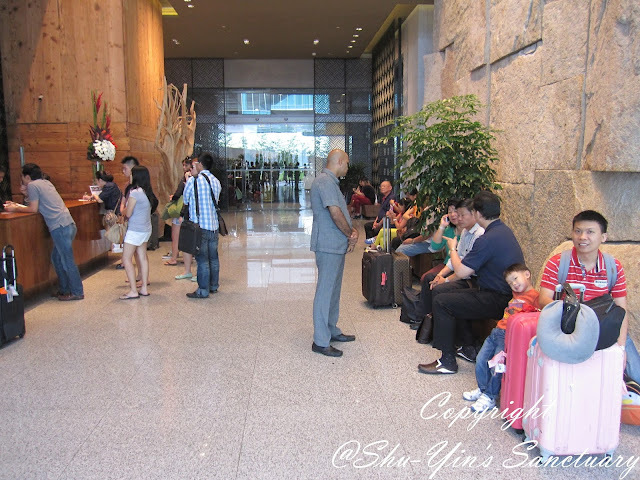 It costs us about SGD20 from the airport to Oasia Hotel in Novena, and took about 20 minutes. Shern standing against the deco wall for a pic at the hotel lobby. We freshened up ourselves in our hotel room. We all showered and changed our clothes, and when we were ready to go out for some food nearby, guess what? What to do? We needed to go back to the airport for it! Luckily it was about 3pm by then so it was off-peak hours. We hurriedly took a cab there as I shuddered to think of the jam later in the day as they would be having fireworks and National Day events on. Khye fell asleep in the car, and after a while Shern fell asleep too. They were both tired by then. 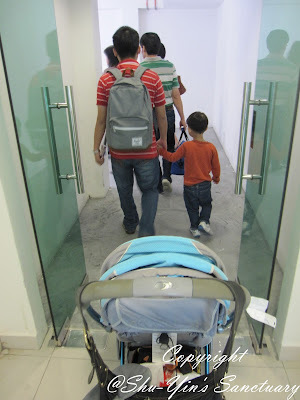 So hubby carried Shern out at the airport (coz no stroller yet :P), and Khye stayed asleep as I babywore him. 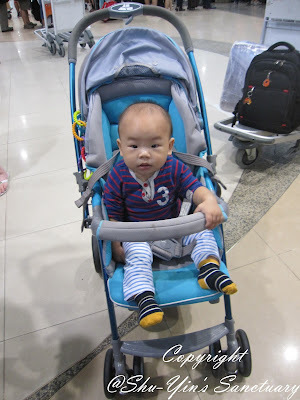 I reached the airport Terminal 1 Arrival Hall and straight went to the 'Information/Enquiry' counter and I told them about the uncollected stroller. They asked me to sign a form and asked for my passport and boarding pass. Then at the side gate (meant for craft crew) they asked me if there would be any one to take care of Khye because only 1 person was allowed to re-enter. 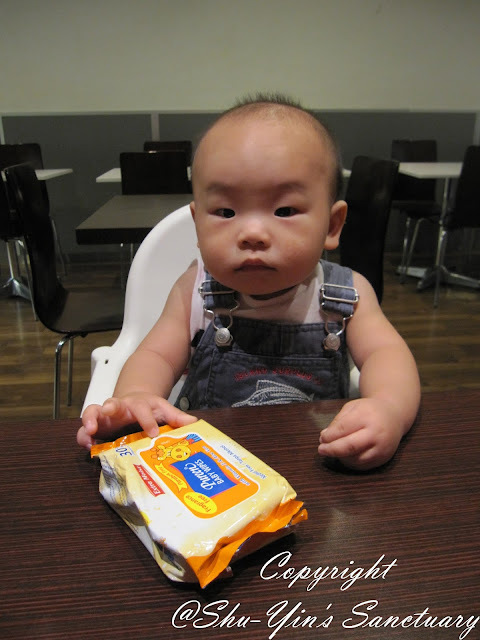 I told them 'No' as hubby was carrying Shern who was asleep and there was no one else beside me. So I told them that either they let me in together with Khye, or I could wait outside there and they help to bring my stroller out to me. They let me in straightaway hearing that! Haha. Then, we were contemplating whether to buy our SMRT cards at the airport and take the MRT to Orchard Road to save some taxi fare. Then changed our mind when the ticket counter is at the next terminal and they told us the journey via MRT would take us an hour. We were tired by then, and the taxi fare wasn't that expensive anyway, so we took the taxi to The Forum Shopping Mall in Orchard. We were so hungry by then so we just stopped at the nearest food place which happened to be Secret Recipe and sat down for some food. 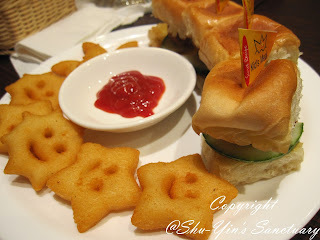 Shern had this mini burgers with stars and moons potatoes and a chocolate milkshake, while I had the Prawn Pasta. 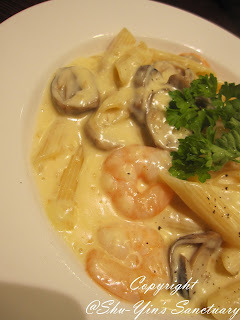 Hubby had the fish. All were just so-so but we were so hungry, we finished everything. What did Khye had? My milk of course! I wanted to go to this mall because this mall sells everything for kids. It's like a mall dedicated to selling kids stuff! It wasn't a big mall, but really specialized and I had fun spending a little time there looking at kids' stuff! We then walked to the nearest MRT station which was Orchard Station, and it was quite a distance. We were so tired by then and it felt like an eternity on that 20 minutes walk. 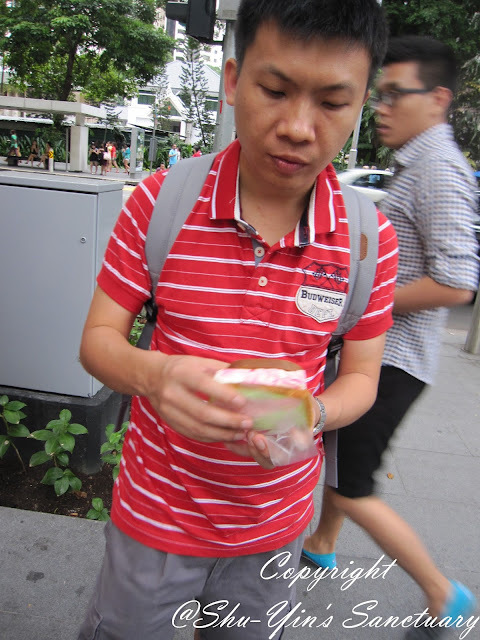 Hubby saw a stall selling the old-school ice-cream sandwich and he bought a piece. I was too full to eat. Upon reaching the hotel, we all showered again and by 8.30pm, lights off and everyone fell asleep. We didn't even watch the live tv on the National Day program. We were so tired. I was about to end this blog post on Day 1 with us saying goodnight, but a mishap happened in the middle of the night. 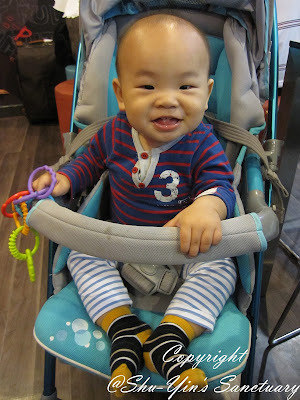 Our hotel came with a baby cot for Khye. And guess what? 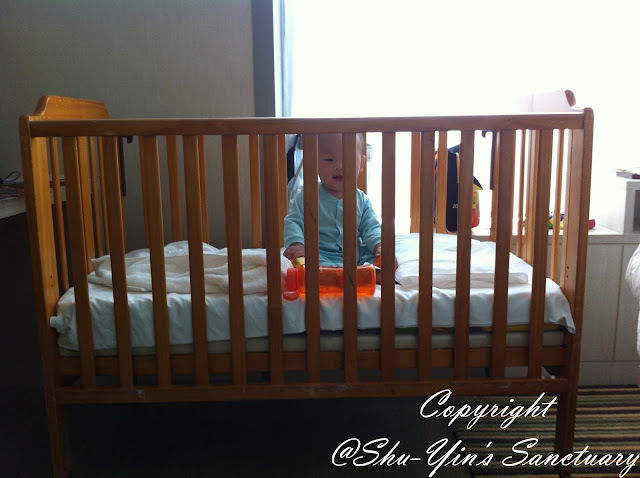 In the middle of the night at 3am, I heard a loud THUD, and saw that the base of the cot crashed down WITH KHYE INSIDE IT. Luckily the base wasn't very far off from the floor. Khye was crying of course, not sure in shocked or in pain. I switched on the lights and had a quick check on Khye. No blood and no bruise. I told hubby to fix the base back properly and only realized it couldn't be fixed. The cot was faulty and they tied a raffia string somewhere there to secure the faulty area. I was shocked and upset. I let Khye sleep beside us on the bed for the rest of the night. The next morning, I called up the hotel reception to complain. The manager was off duty and the person just said sorry and changed the cot for us. I was still upset but was glad Khye seemed alright, thank goodness! So, this sums our experience in Singapore for Day 1. 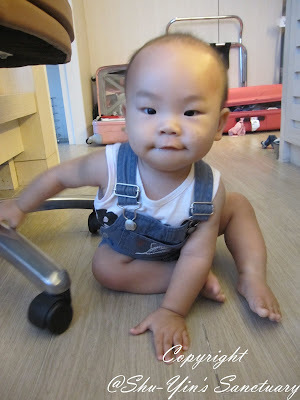 2 mishaps on our first day there - the forgotten stroller, and the faulty cot! To read more about our Singapore Trip, read click here.